A ride with Grandma and her aging followers is an authentic trip back in time. Roderick Eime is aboard for the ride. Grandma's working life began in 1955 taking regular trips between Sydney and Melbourne in the glory days of Australian rail when the shiny Southern Aurora was the bees' knees in interstate travel. 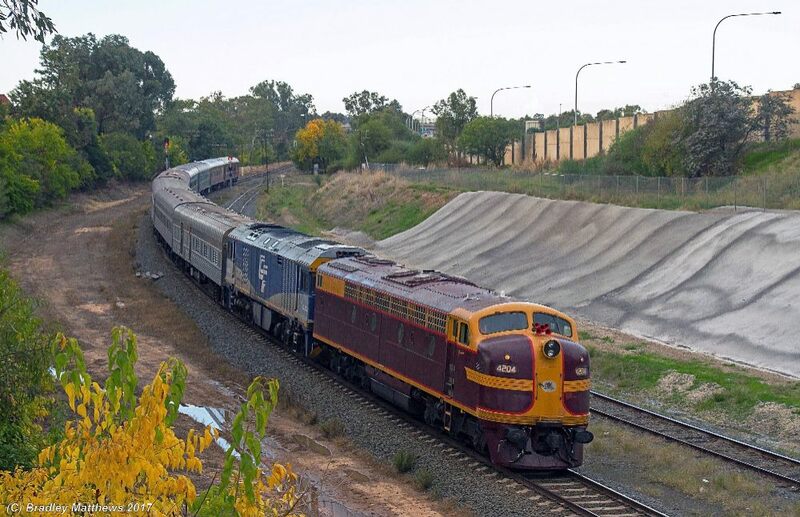 Back then, she'd haul 200 travellers the 500-odd miles at a cracking 65mph a couple of times a week along the century-old rail route between Australia's largest capital cities. Some would be tucked up in First Class Sleepers, while others would ride the comfy recliners. Others might make a jaunty time of it with a claret or lager in the plush lounge car. Today Grandma is taking me on a nostalgic trip back down the line via Junee and Albury to Seymour where she'll hand over to her elegant contemporary, the 'Spirit of Progress'. To tell you a bit more about the old girl, she's a 42 Class diesel-electric locomotive powered by a 100 litre, V16 two-stroke engine dishing up some 1600 old fashioned horsepower. She's hooked up to a bit of a motley collection of rolling stock dusted off from the Transport Heritage Trust of NSW's inventory of retired carriages, most of which normally reside at either the 'old rollers' museum at Thirlmere on Sydney's southern outskirts or Eveleigh. Many of the vintage carriages were constructed at the Clyde workshops in Sydney's west back as far as the 1930s with most finally being put to pasture in the '80s and '90s. 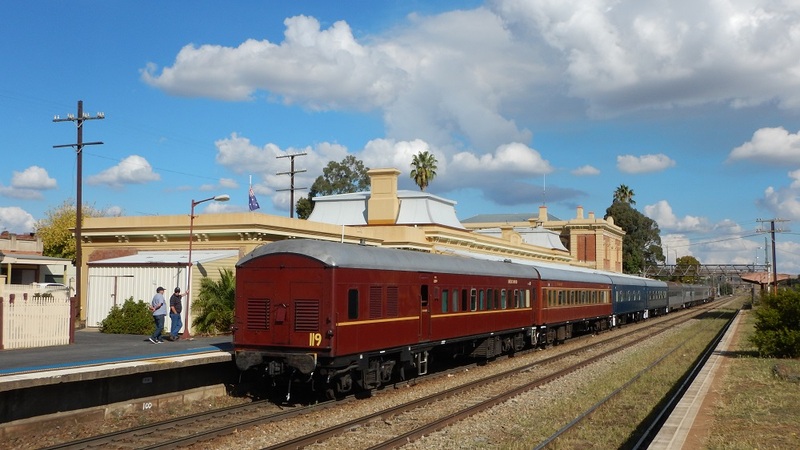 We have two from the original Southern Aurora and others from the mid-20th century Newcastle and Riverina Express routes. 150 mostly graying, train-mad travellers are cheerfully bouncing along, swapping tales of the rail journeys of their youth, some even recalling the steam era. In fact, I'm writing this from the lurid orange vinyl bench seats of the '70s era dining car that formed part of the Indian Pacific until 1994. 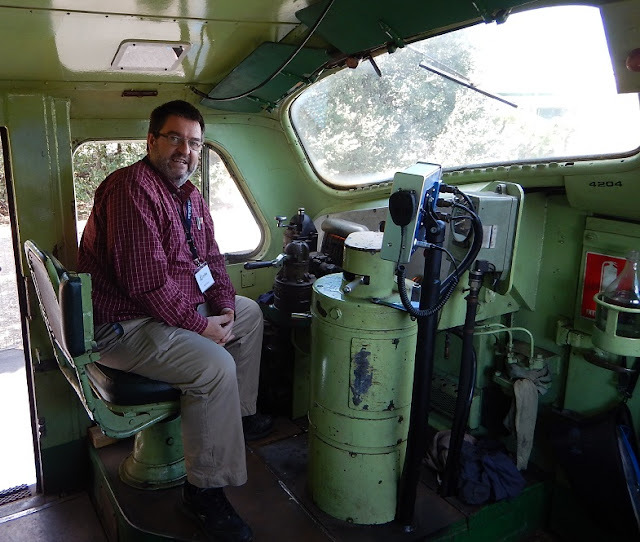 Alex Crass is one of the several volunteers staffing the train. 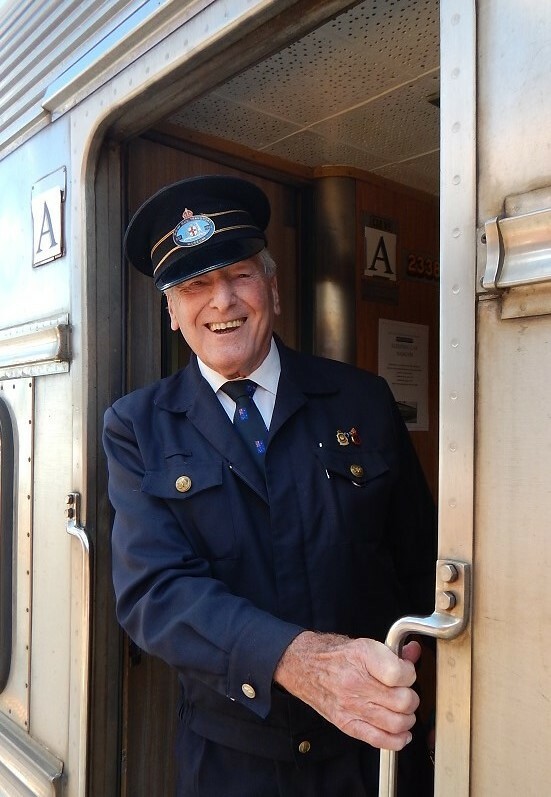 He's already given more than half a century of service to the railways, yet still squeezes into his conductor's uniform and flashes a broad trademark smile that speaks volumes. Like ships and airplanes, once rail gets in your blood it's near impossible to purge. And so it is with the eight score passengers on our Sydney Limited reprise. The brainchild of Richard Boyce from Sydney travel agency, Cruise Express, Richard is an unabashed train nerd who talks in acronyms like PFZs, NAMs and RUBs – all model types of rolling stock in Grandma's wobbly entourage. Passengers complete one way by heritage train of one sort or another, then return in lavish luxury aboard a Princess Cruises' ship. Or vice versa. Brisbane is also on the menu. “It's been quite a bit of work to secure these trains,” says Richard with obvious understatement. I know that quite apart from negotiating the inevitable bureaucracy that comes with the intricacies of combined volunteer, not-for-profit and government agencies, he spent many hours with such necessary tasks as washing and ironing the dusty carriage curtains. Such has been the success of these 'Rail & Sail' packages that rail buffs from all over the country have gravitated to this lure of the loco and Richard has a waiting list that will see him through the next couple departures at least. While Grandma takes a well-earned rest after back-to-back long haul runs, smaller, lighter 'rail motors' will be used more often. These diesel-powered trains, like the so-called 'Tin Hare' were more common on shorter regional routes but have also proven surprisingly popular with 'Rail & Sail' clients. Either way, nostalgic rail lovers and cruise fans will get a double dose of their favourite means of propulsion when the next round of these peculiar voyages are announced.